During the eviction drive at Chandranagar-Papu Nallah, building owners alleged that they did not receive any notice. Where the Capital Complex District Administration carried eviction drive for 2nd day in Chandranagar on the same time building owner continue to protest and business establishment shut down their shutters. Two structure was demolished on the Thursday, while the demolition of two more structures was underway. During the eviction drive here at Chandranagar, building owners alleged that they did not receive any notice on the eviction for beyond Right of Way (RoW), and neither were they compensated for the same. ” We did not have any issue with the eviction drive, within the RoW, but before that administration should issue a new notice to building ownerfor eviction beyond the . The magistrates on duty explained to the owners that notices were already served to all the building owners and they were adequately compensated for the same, we will continue to demolish all structure in the ROW except few of those who were exempted by the court. 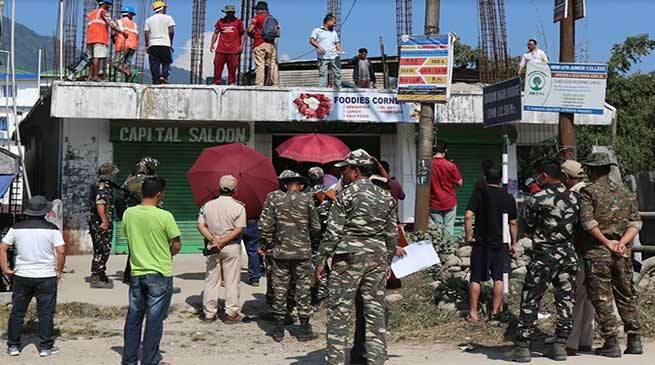 Meanwhiel the Businesses establishment in the capital city under the banner of Itanagar Market Welfare Association (IMWA), except a few medical stores, also kept their shops closed in protest of the eviction drive and opened late evening. In a message to the media IMWA President Yumlam Achung said that we are not against the development but there should be a proper policy for rehabilitation and resettlement for the shopkeeper. There was no intimation to the traders who are running their business since along time are badly affected.